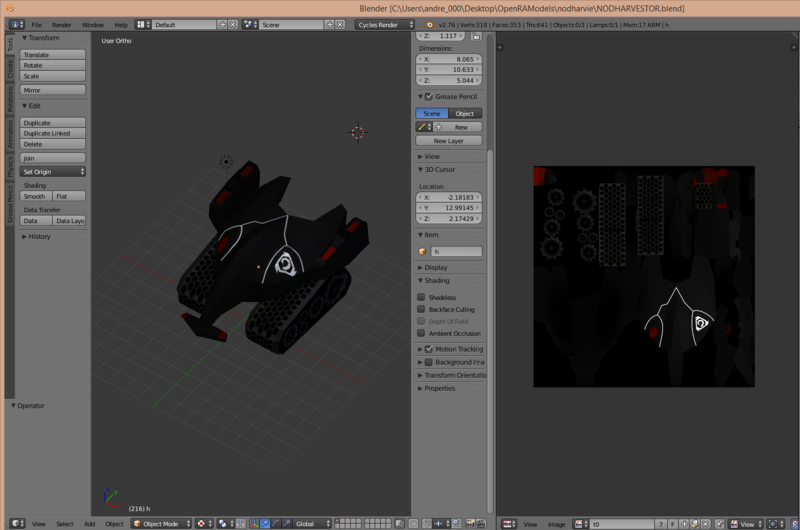 Iam using VSLSE 3ds2vxl plugin to convert a model i made from scratch in blender to vxl format to use in OpenRA. Only the material colors are used. Ive tried everything, ive made sure the 3ds model materials and texture names are shorter than 8 characters. Ive also made sure the texture is on the same folder as the 3ds model. And ive looked into the 3ds file itself and the texture and materials are properly saved. I can supply the 3ds file + texture if anyone is willing to help me. You have to use BMP textures and not PNG, from what I know. Although I never used that tool myself because it generates terrible results and touching them up to be acceptable by hand might take as much time as recreating them from scratch. Ever since the voxelizer started using SDL DLL files, it hasn't been so limited in which picture file formats it could use for textures. Texture conversion should work although there are still some problems such as BMP files, of the paletted variety, or the compressed variety, not working for example, if I remember correctly. Maybe you should try different picture formats. Thank you for the reply, i wasn't expecting to be so fast. I have tried several different formats from compressed to uncompressed, and currently what happens is that the .vxl is written, says so on the command window, and then 3ds2vxl crashes. After it crashes the model appears to be correctly generated but only with material colors. Like i said in the original post. So i think it might be two problems, either i didn't set up my 3ds file to have the associated texture file, or my image format is incorrect. However i have pretty much tried all of the export options in paint.net and photoshop. Well feel free to tell me more stuff to try, or you can download the associated 3ds file plus the texture here if you have the time to look at them. I have not been able to solve the problem yet, and now I need a long break. By the way, have you tried reimporting what you exported from Blender to see if your 3DS file is correct? Don't worry iam not in a hurry, as loong as this hopefully gets fixed its fine in my book. Yes i have reimported the model into blender and material and texture info seem fine. I have also exported the model in .obj format and reimported it and it does have textures and materials assigned. Furthermore opening the .3ds file with a regular text editor i can find the material names and texture names in the file itself. I downloaded the model & imported it into 3DS Max & it gave me a UVW mapping error. What kind of error, let me guess blender 3ds export is broken? It just says that the UVW coordinates are missing. 3DS2VXL will display the names of meshes, materials, and textures in its text output, which I will admit is very messy and confusing. I don't see any texture name there. However, I do see a texture name when viewing the 3DS file in a text editor. I really don't know what is happening. Sorry for double post, but for future reference because i know several people have posted this in other threads. The 3ds format is aparently deprecated and unsuported in some 3d modeling programs. Just make sure to use a working 3ds exporter it took me a very loong time searching the internet but i finaly found a solution. So, you have to use an old version of Blender? That is a bit ridiculous. Do you have to use an old version of Blender, or does the new Blender let you switch between different versions of the 3DS exporter to use? By the way, the 3DS2VXL crash is probably because 3DS models exported from Blender are missing animation related data, which such files normally have even if there is no animation, from what I remember, and 3DS2VXL was mistakenly not programmed to initialize that data with default values if the data is missing from the 3DS file. This bug prevents 3DS2VXL from making an HVA file for the VXL. If a program requires an HVA file to exist for each VXL file, then I think a generic default one can just be copied and used instead, considering that there isn't actually any animation, in this case. You can use a newer version of blender to make the model plus texture. But then you have to save it in .obj form import it into the old version set the materials and then export the 3ds from there. The conversion works but the end result looks a bit too dark, only red color and black/grey colors appears. But thats for another day and perhaps another thread. Why are you transferring the model, from the new to the old version of Blender, as an OBJ instead of a 3DS file? Is the voxel too dark no matter what methods you use? 3ds files created with later than 3DSMax9 versions? Well it can be that 3ds2vxl uses an older 3ds format. But i don't know, so far what ive seen is that the newest blender 3ds format is imcompatible with the blender 2.43 3ds importer. And only the 3ds format exportable from blender 2.43 seems to work. In terms of what i did about the texture, it only seemed to recognise red, when i added some patches of red to my model and increased their saturation to maximum. The rest was random patches of dark, in general the texture conversion was extremely bad. If you have any tips of what kind of colors i should use or if i should have a consistent palete of colors feel free to post. The bright white logo should have appeared quite bright. I expect the white lines might look a little dark after voxelization because they are very thin, and the voxel is probably low resolution. So, the white lines will be blended in with a lot of surrounding blackness. There is a feature of 3DS that allows textures to be mixed with the material flat properties. Therefore, you can make the textures look dark by mixing them with black flat material color. Are you sure the texture was turned up to 100% in the material? Anyway, besides this, 3ds2vxl has a feature to turn up the brightness of voxels because darkness was complained about before. By the way, I don't recommend using the color black for voxels in these games. If I remember correctly, the official games don't render black voxels as shiny and therefore the black will just look like shapeless death void. DonutArnold just said that the texture files have to also be in the same folder as the .blend file for the .3ds textures to work. That seems strange, but anyway, does that work for you with the latest Blender version? awww man, this issue has plagued me for over 6 months and only just read this thread.